Cask strength bottlings from Writers Tears are becoming as reliable a way of marking the passage of years as the annual Midleton Very Rare vintage. Just released is the 2013 edition, the third in the sequence by my count. The signature style of Writers Tears is a blend of triple-distilled single pot still and single malt whiskeys, with slightly more pot still than malt, matured exclusively in ex-bourbon casks. I'm told there were 7 pot still casks and 5 single malt casks used here. Remember those numbers - we'll come back to them when The Irishman Cask Strength is released in a couple of weeks. It's 53% ABV this time around, with a 2,500 bottle run. Of course it's non-chill filtered. The official tasting notes describe it as "a wonderful combination of soft bourbon notes with a light malty subplot. Following through with a creamy oak and spice that gives it magnificent superb complexity which balances its expressive strength." There are only 200 bottles allocated to Ireland and, for the moment, it can only be had from the Celtic Whiskey Shop at €125. I don't know exactly where the other 2,300 bottles are going but Writers Tears is currently exported to Canada, France, Germany, Holland, Switzerland, Austria, Poland, Bulgaria, Ukraine, Australia, Italy, and Belgium. Just this week, the company behind Writers Tears renamed itself Walsh Whiskey Distillery and declared its intention to open a new distillery in Carlow, citing the continued growth of the Irish whiskey category. 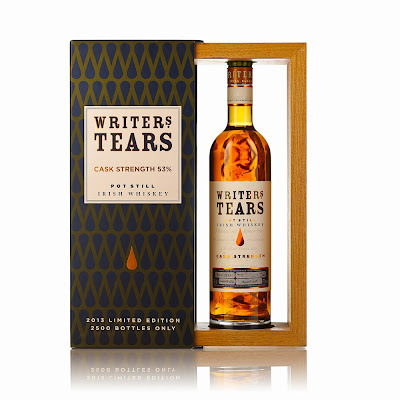 We can perhaps see evidence of that growth in the number of bottles of Writers Tears Cask Strength released each year: 1,200 in 2011, 1,800 in 2012 and 2,500 this year. The company itself grew 35% in 2012.